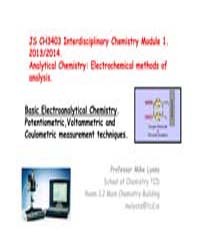 Description: This note covers the following topics: Introduction to electroanalytical chemistry: basic ideas, Potentiometric methods of analysis, Amperometric methods of analysis, Coulombic methods of analysis. By: Belcher, Ronald; Wilson, Cecil L.
By: BOUTELIER, C. ; COLIN, J; TIMBAL, J. The first four editions, 1894-1903, have title; A text-book of volumetric analysis.